other means of financial reporting. efficient use of scarce resources. of the Codification for GAAP. 3. 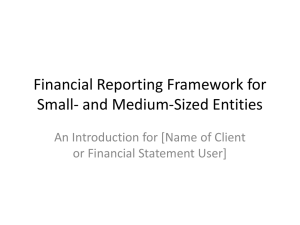 Identify the objective of financial reporting. 4. 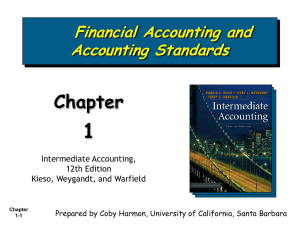 Explain the need for accounting standards. 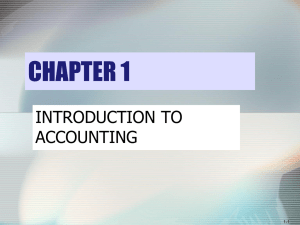 LO 1 Identify the major financial statements and other means of financial reporting. 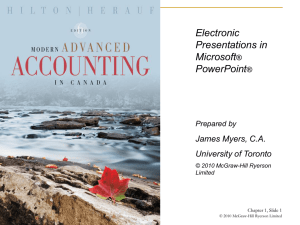 To correct improper presentation in the financial statements. To present management’s responses to auditor comments. determines whether a business thrives. LO 2 Explain how accounting assists in the efficient use of scare resources. “It’s the accounting.” That’s what many investors seem to be saying these days. • Stocks take a beating as accounting woes spread beyond Enron. • Quarterly reports from IBM and Goldman Sachs sent stocks tumbling. • VeriFone finds accounting issues; stock price cut in half. • Bank of America admits hiding debt. • Facebook, Zynga, Groupon: IPO drops due to accounting, not valuation. in making decisions in their capacity as capital providers. LO 3 Identify the objectives of financial reporting. LO 4 Explain the need for accounting standards. their role in the standard-setting process. Accounting and reporting for public companies. SEC requires public companies to adhere to GAAP. Wheat Committee’s recommendations resulted in creation of FASB. Selects members of the FASB. Consult on major policy issues. A public hearing on the proposed standard is held. and issues an exposure draft. 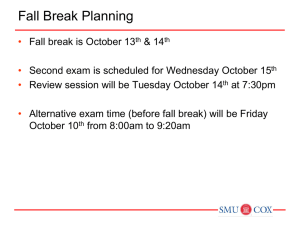 Topics are identified and placed on the board’s agenda. Principles that have substantial authoritative support. 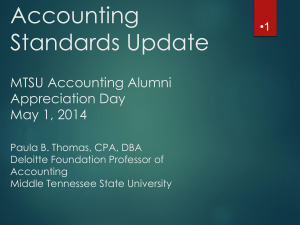 FASB Standards, Interpretations, and Staff Positions. (GAAP) and the role of the Codification for GAAP. 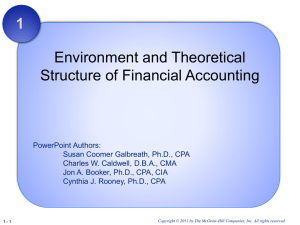 FASB Statement of Financial Accounting Concepts. AICPA Accounting Principles Board Opinion. at ensuring that companies’ financial statements are fairly presented. exercise judgment in applying GAAP to achieve high-quality reporting. the authoritative literature related to a particular topic. Creates one level of GAAP, which is considered authoritative. All other accounting literature is considered non-authoritative. 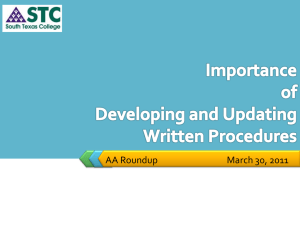 provides easy access to the Codification. LO 7 Describe the impact of user groups on the rule-making process. why accounting convergence has been so elusive. accountants think they can do. Difficult to close in light of accounting scandals. LO 8 Describe some of the challenges facing financial reporting. U.S. GAAP, issued by the FASB. In accounting, we frequently encounter ethical dilemmas. GAAP does not always provide an answer. Doing the right thing is not always easy or obvious. LO 9 Understand issues related to ethics and financial accounting. but in markets around the world. there are differences between what is in this textbook (which is based on U.S.
needs of investors and creditors. 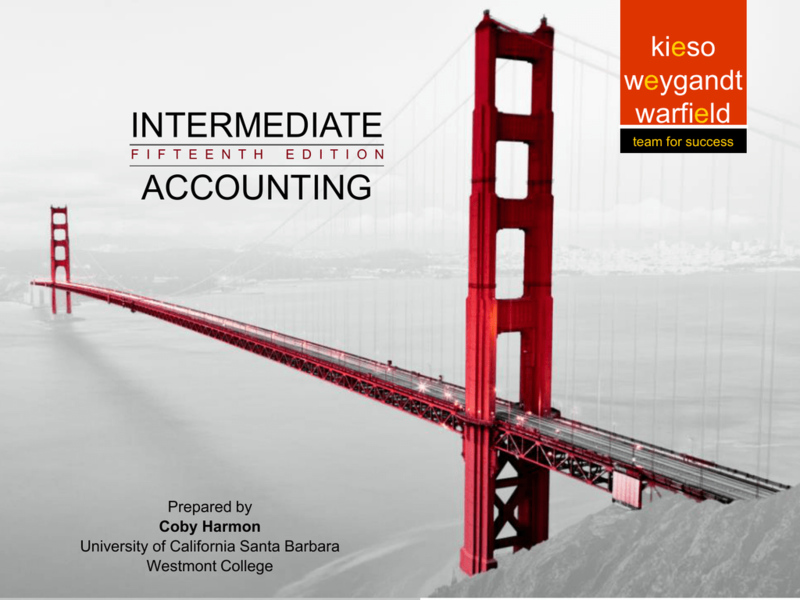 and accounting standards under GAAP and IFRS. the merits of “principles-based” versus “rules-based” standards. 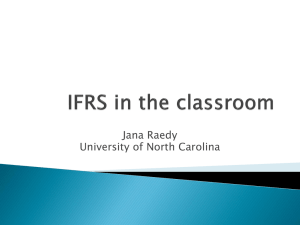 IFRS financial statements without reconciliation to GAAP. Standards used on most foreign exchanges. Standards used by foreign companies listing on U.S.
IFRS used in over 115 countries. a. International Federation of Reporting Services. b. Independent Financial Reporting Standards. c. International Financial Reporting Standards. d. Integrated Financial Reporting Services. Does not set accounting standards. c. IOSCO and the SEC. Any U.S. incorporation of IFRS in GAAP will occur over several years. 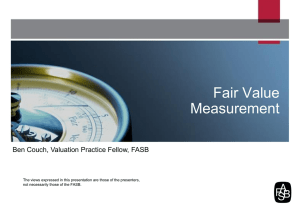 c. The IASB has been in existence longer than the FASB. the IASB has a larger number of board members. optimistic that this goal can be achieved, which will be of value to all. Copyright © 2013 John Wiley & Sons, Inc. All rights reserved. express written permission of the copyright owner is unlawful.